My name is Fan Yufen. I was born in a poor family. My father undertakes all the burdens of my family. So he has to work in the city all year round. We are poor, but we are happy at that time. Unfortunately, my father died in an accident when I was ten years old. My family nearly collapsed. In recent years , my weak mother has supported our family by a few fields. The income is less than two thousand yuan each year. So she has to borrow money from some relatives to afford my brother’s and my tuition fees. 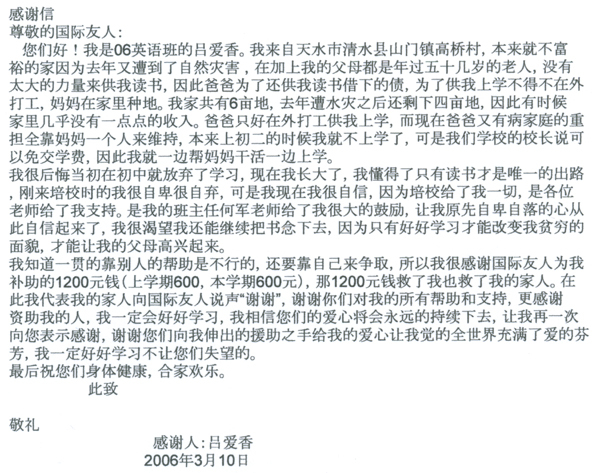 Fortunately, I have got twelve hundred yuan (last term, 600 yuan, and this term another 600 yuan) from your foundation scholarship as my living expenses. Thank you very much for that. It’s no doubt a great assist to my family. I wish I would express my thankful feelings at your presence in the future. Thank you again. I will study hard to repay you and the other people who helped me before . When I have my own future. I will give your love to the others who need it. My name is Liang Yahui. I am a 20-year-old girl from a barren village. There are five people in my family, my father, my mother, two younger brothers and I. My mother is always laid up by illness and my father was burned by gasoline. He has to go out for working in order to support the family. 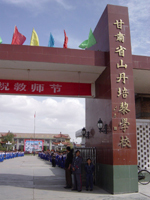 One of my brother is studying in Shandan Bailie School too. The tuition fee is not high in our school, but it still is a heavy burden to my family. Fortunately, I have got twelve hundred yuan (last term, 600 yuan, and this term another 600 yuan) from your foundation scholarship as my living expenses. Your help to me gives my parents lots of warmth .All my family members will remember you and your assist. After graduating from shandan Bailie school, I will become a member of the society with a warm heart. I will help the other people who need assist like you help me. Thank you again! I am Chang Xiaorong, a student of 05 English Education class one. My hometown is a barren village in Huining county, Gansu Province. My parents are peasants . They have to work on the fields all year round. But the harvest is always not good for lack of water. My mother has to take medicines continuously with arthritis. It’s a heavy burden to our family so it’s really difficult for my parents to afford my sister’s and my tuition fees. My father always borrows money from some relatives and friends. But it still can’t solve our problems. At the special moment, your assist twelve hundred yuan (last term, 600 yuan, and this term another 600 yuan from your foundation scholarship as my living expenses) brings me a hope and a new chance to have a brighter future. On behalf of my family I want to say: Thank you very much! I am an excellent student. I always work hard with my major. I will continuously make a great progress every day. Thank you again! I am Ma Ruiying, a girl from a very poor family. 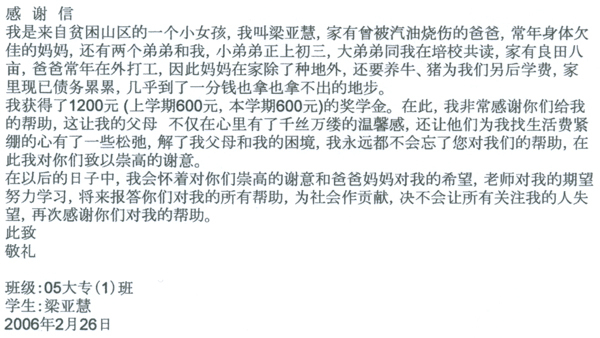 Your financial help (last term 600 yuan and this term 600 yuan - 1200 yuan total) to me brings me a chance to study and makes my heart full of love and gratitude. On behalf of all my family members, I would like to express our heartfelt thanks to you. My family has six people. My sister and I are all at school. Our tuition fees are a huge burden to my parents. 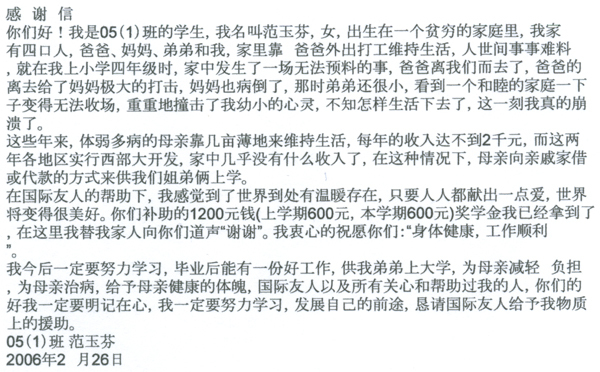 Luckily, I got the special scholarship - twelve hundred yuan (last term, 600 yuan, and this term another 600 yuan) from your foundation scholarship as my living expenses, which reduce my parents’ pressure. Now with your financial assistant, I can study contentedly at school. Your help is like a warm sun in a cold winter and a bright light in a dark night. I will study hard to repay you and do my best to help others just like you. Thanks again!